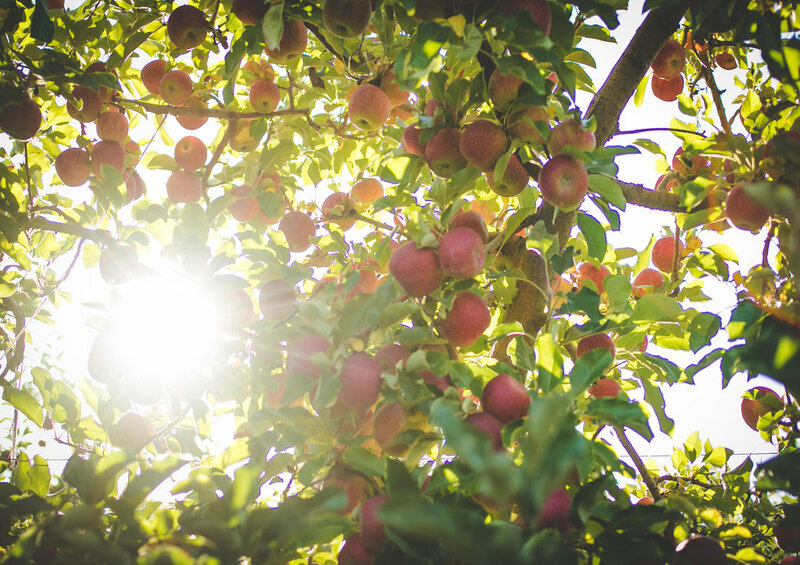 Did you know that the Western Cape province accounts for more than half of all the apples produced in South Africa? South Africa’s main apple producing areas are Groenland, Ceres, Villiersdorp (all in the Western Cape) and Langkloof East in the Eastern Cape. Able to achieve higher prices for their fruit overseas, the local apple industry is very much focused on the export market. With the recent growth and innovation in the Cider market, a family farm in the Ceres area set out to become one of the first local producers of premium quality Cider in the Ceres Valley. 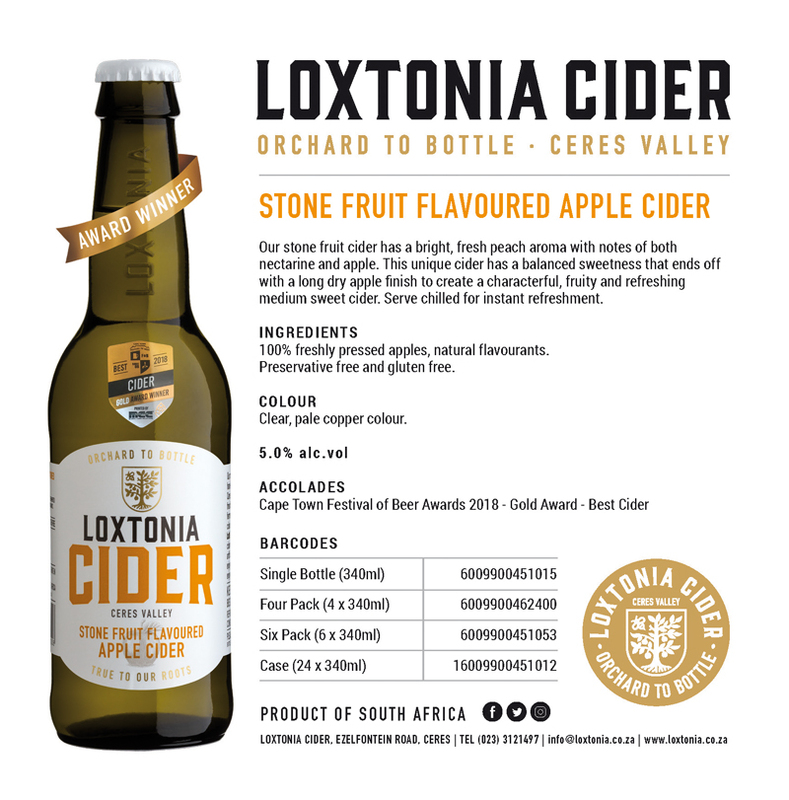 After much investigation, research, learning and experimenting, Loxtonia Cider is the newest Cider kid on the block for the South African market. 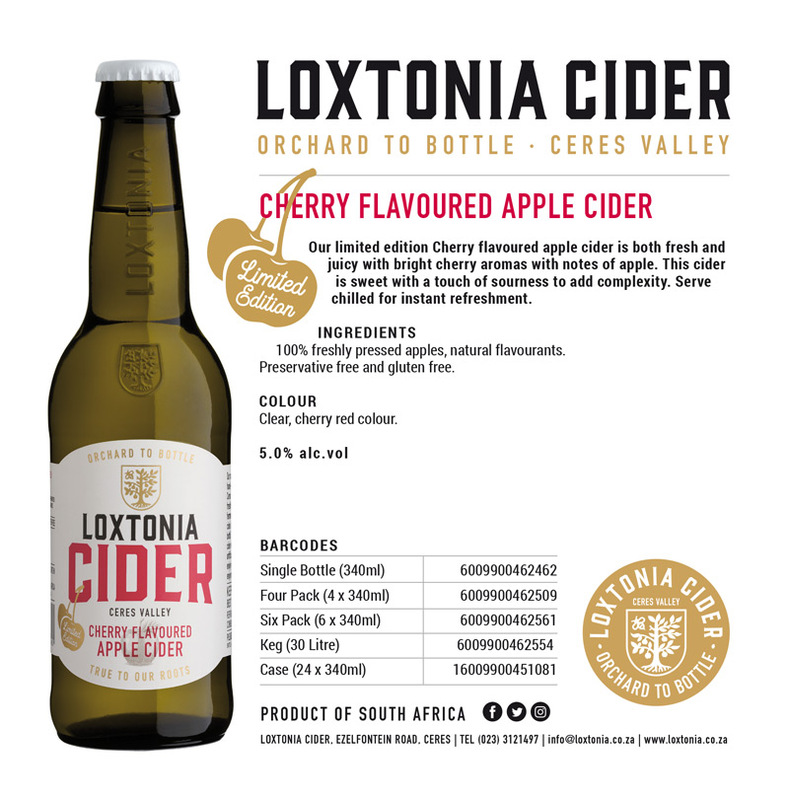 With a range of four delicious options (and a few more in the pipeline #watchthisspace), Loxtonia Cider is set to become a firm favourite with the growing local Cider- appreciating community. The first apple was picked by Eve…..oops, sorry, wrong story….. The first apple picked in South Africa (known as a Wijnappel) was apparently picked in the The Company Gardens (known today as Cape Town) during April 1662. A mere 150 km or 90 minute drive from Cape Town, you’ll find Loxtonia Cider’s home – the beautiful Ceres Valley. Tucked away in a crescent of mountains, the Valley offers near perfect conditions for apple farming. 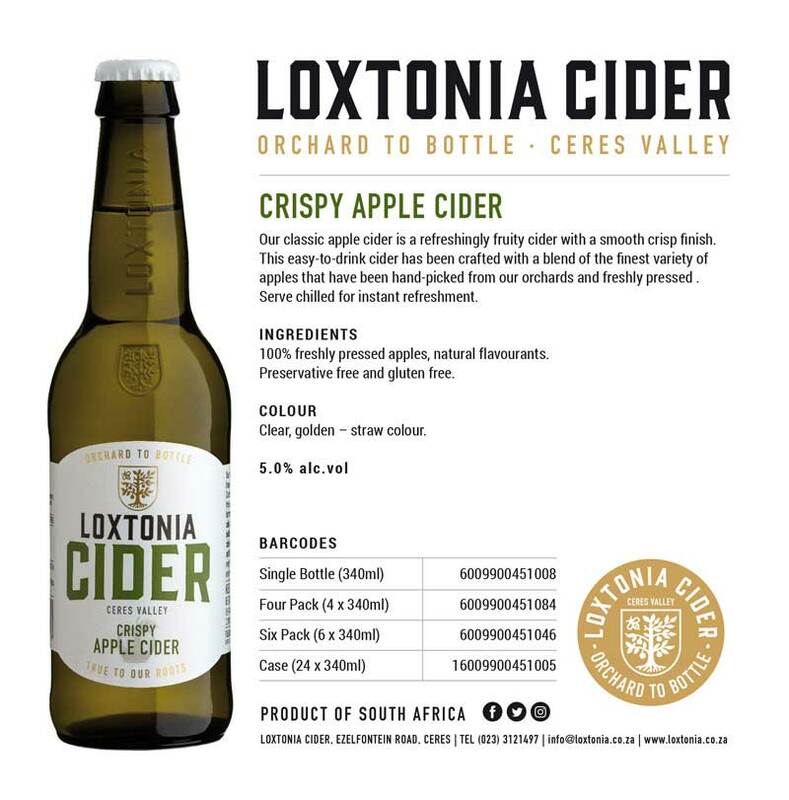 The climate of cold winters and hot summers in Ceres is ideal for apple production, allowing Loxtonia Farm to harvest not only delicious tasting apples but also pears and plums. January and February are regarded as the hottest months of the year with an average maximum of 29,9°C measured during February whilst the average minimum of 2,4°C is measured during July. Ceres falls within a Mediterranean climatic zone, with an average annual rainfall of 108mm which occurs mainly during the winter months reaching a peak during July of approximately 200mm. Snowfalls on the high mountain peaks is a common occurrence during winter and remain for up to 2 weeks at times. 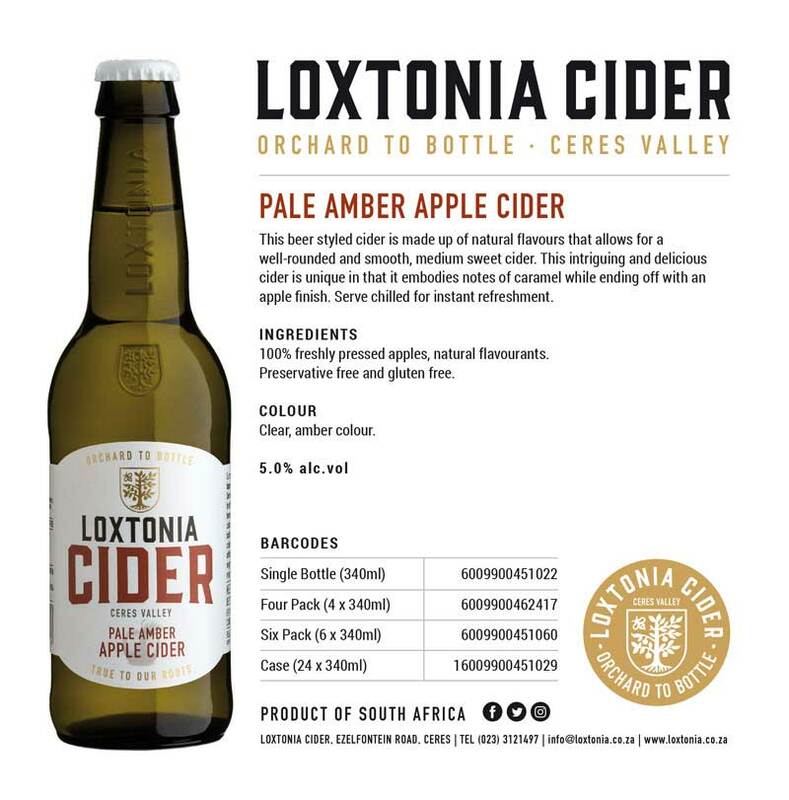 “The critical time for our apple trees is during winter, when cold weather is essential for securing a tree’s accumulation of sufficient chill hours necessary for steady fruit yields,” says Kobus Koegelenberg, Loxtonia farm manager. Cider is tapping into the beer and wine markets as well as the gluten-free, honest ingredient (preservative free, environmentally friendly + vegan) trend, and it is developing a fresh, new identity. It’s an exciting time for Cider drinkers, with loads of product and taste innovation that makes for new and healthier drinks options. 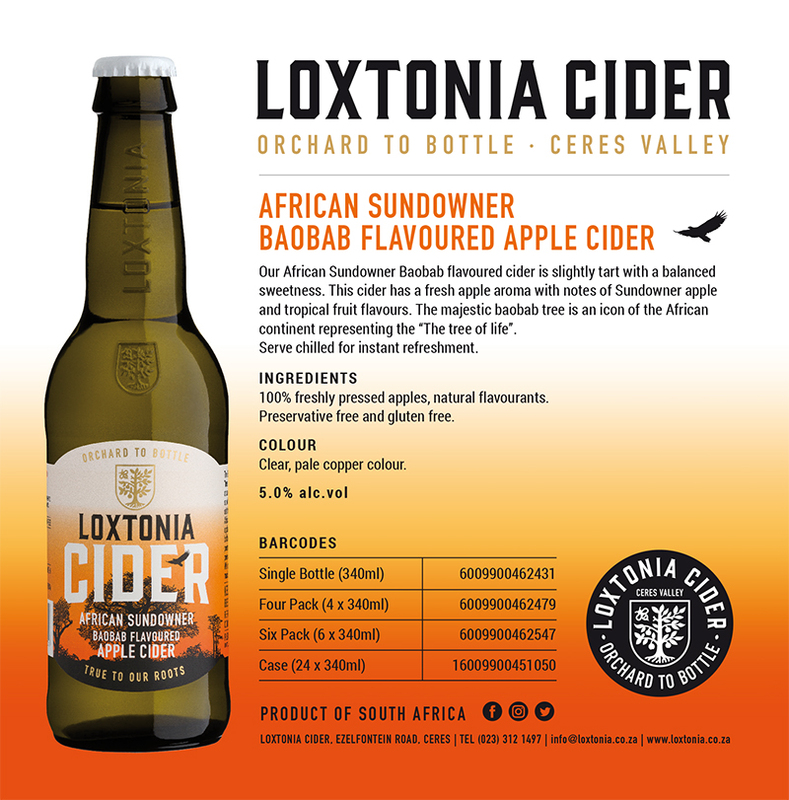 Loxtonia Cider’s philosophy of ‘Orchard to bottle’ using hand-selected apples that go straight from their orchards to their farm-based Cidery and into the bottles, is right on trend with the internationally booming Cider market. We really hope you enjoy the Cider as much as the team loves making it! Cider - A Millennial (those born between 1985 and 2000) Favourite!